An art-deco spire of flame colored flowers rises from a mound of leaves beside the trail. Each flower is dramatically flattened, hooded and flared. This is African cornflag, or Chasmanthe floribunda, an escapee of ornamental garden plantings. It’s not a common sight in the wild, but it is established in patches, usually on the edges of residential areas, so that it could be mistaken for a native. This flamboyant bulb is a member of the iris family, and can superficially be mistaken for the similar-looking non-natve, montbretia (aka crocosmia). 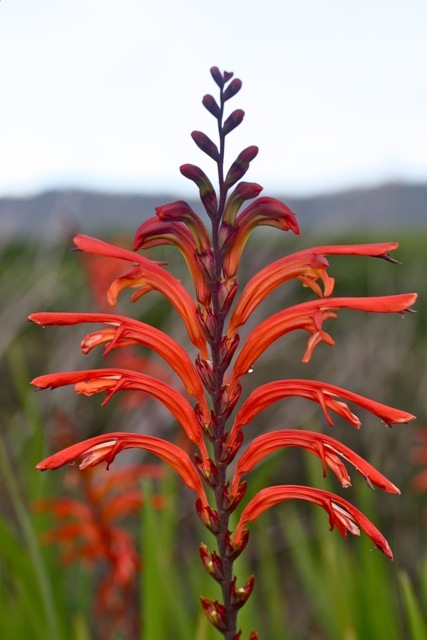 But though the color and growth pattern are similar, the flowers themselves are completely different–montbretia has open, symmetrical petals while African cornflag blossoms are narrow, curving horns that open at the mouth like a hummingbird feeder.